In a small saucepan, bring 1/3 cup of the sugar and 1/3 cup of water to a boil, stirring to dissolve the sugar. Pour the simple syrup into a heatproof 1-quart jar and refrigerate until cold, about 30 minutes. Add the lemon juice, turmeric and 1 cup of water. Cover and shake to combine. Meanwhile, in a small saucepan, gently simmer the blackberries with the remaining 1/3 cup of sugar and 1/2 cup of water for 10 minutes, pressing on the berries with the back of a spoon to break them up. Strain the blackberry syrup through a fine sieve set over a small pitcher or measuring cup. Cover and refrigerate until cold, about 30 minutes. To serve, fill 4 collins glasses with ice. Shake the turmeric lemonade once more and divide among the glasses. Whisk the seltzer into the blackberry syrup and pour over the lemonade. Do not mix. Garnish with lemon wheels and Thai basil, if desired; serve immediately. 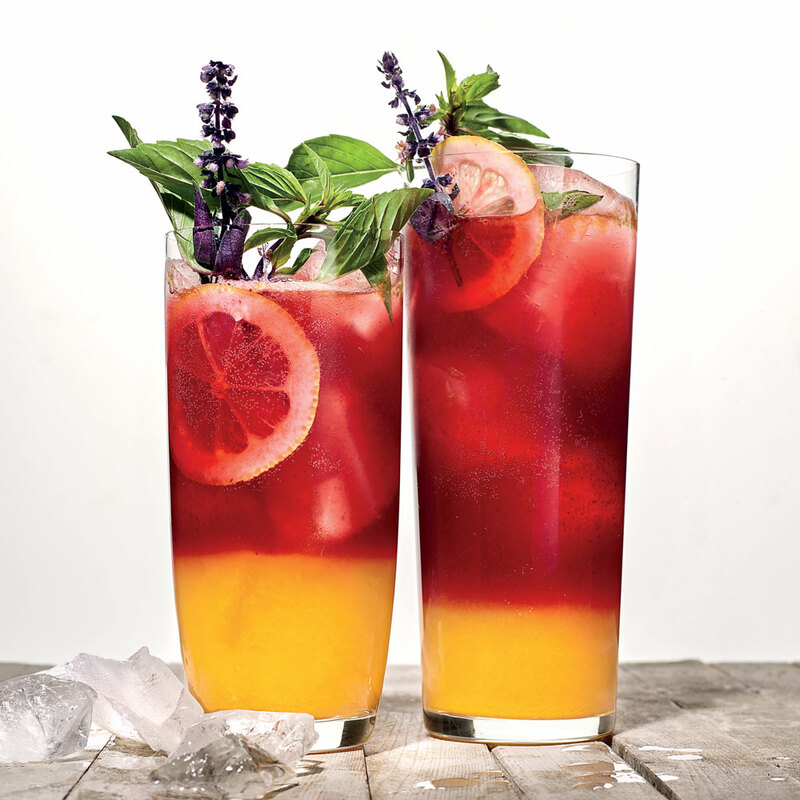 The turmeric lemonade and the blackberry syrup can be refrigerated separately for up to 2 weeks.